From the internal plumbing of an IT infrastructure to highly visible business services, Smarts takes a service-centric approach to IT management. Founded in 1993, Smarts focused its early R&D efforts on automating the management of dynamic distributed systems. The result of these efforts is a patented technology that intelligently and automatically adapts to managed systems. These technologies include the InCharge Common Information Model, often referred to as “eye-sim” (ICIM), and Codebook Correlation Technology, which are fundamental to all EMC Smarts technologies today. Smarts’ solutions deliver automated real-time root cause and impact analysis of networks, systems, and applications for thousands of customers around the world. Whether it’s a telecommunications network or one that supports an enterprise or service provider, any type of businesses can benefit from Smarts’ ability to automatically adapt to any managed system. 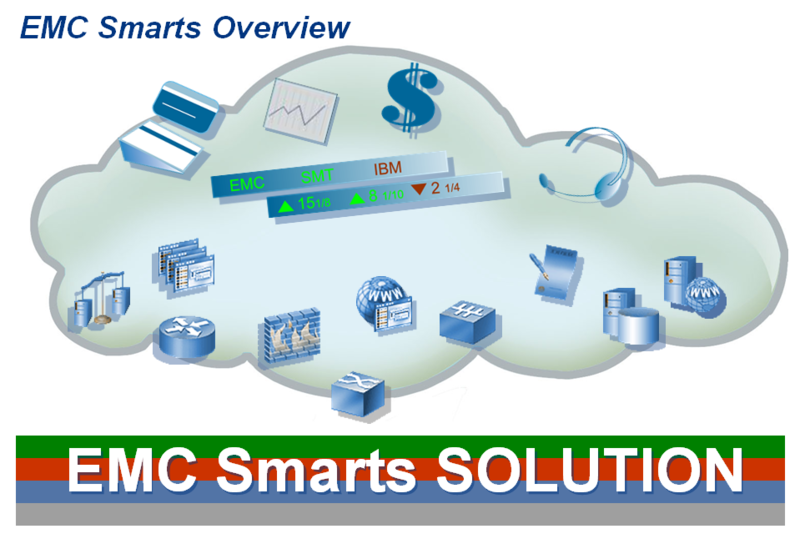 EMC, a world leader in information storage and management, acquired Smarts in 2005 to support its strategy for comprehensive information lifecycle management. EMC’s storage management software, together with Smarts’ modeling, correlation, and root cause analysis technology provides an intelligent combination to ensure the health, well-being, and management of an information network. What do we mean by smart software? We mean software that automates complex IT management tasks that today are still mostly manual, monopolizing skilled resources that could be spending their time far more productively. These are the tasks that require constantly add headcount to operations staff. Discovery and mapping of the overall IT infrastructure in a holistic manner; the network gear, computing systems, applications, databases, firewalls, load balancers, storage, and more. Smarts software not only discovers all the logical and physical objects and elements in your overall IT infrastructure, it also discovers the many relationships and dependencies between these objects; for example, which servers run which applications, which switches the servers are connected to, etc. Monitoring the infrastructure holistically, across IT domains, and automatically integrating and correlating data, events and topology across IT domains. This correlation clarifies both relationships between different objects in the IT infrastructure and the cause-and-effect relationships between behaviors of these objects; for example, understanding that an overloaded server is the reason why applications that run on it exhibit slow response time. Diagnosis of the key problems that threaten business services, whether they arise in the servers, the network devices, the applications, or anywhere else. Pinpointing the problem is essential for resolving it correctly. Identification of each problem’s impact on other IT objects, on the business services they support, and on customers and users of these services. Knowing a problem’s impact is essential for determining the priority and the level of effort that a problem merits, problems that have more business impact merit more attention. IT organizations and service providers are constantly challenged to manage increasingly complex IT environments. However, traditional approaches to IT management do not scale to meet these challenges. As new, more advanced services are introduced to these environments, the complexities increase and traditional approaches become ineffective. 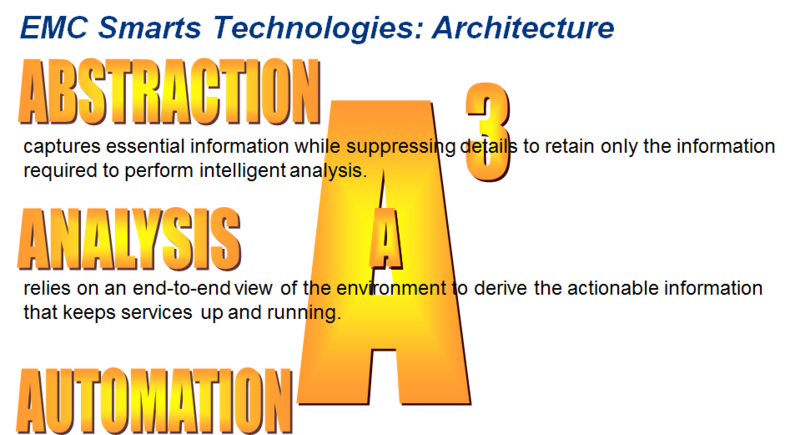 Smarts tackles these complexities with abstraction, analysis and automation. Abstraction captures essential information of an environment, but also suppresses the irrelevant details to retain only the information that is needed to perform intelligent analysis. All physical and logical components, their relationships, behaviors, and interactions are “abstracted” and retained in a library for fast and accurate representation. Analysis provides the brain and reasoning behind Smarts. It determines root cause and impact analysis of service-affecting problems, wherever they occur, and delivers actionable intelligence for resolution. Automation is the only way to effectively scale an intricate heterogeneous IT environment. As business services become increasingly complex, automation adapts and performs tasks that cannot be done manually. Together, abstraction, analysis and automation, or A3, enables Smarts to diagnose key problems that threaten business services and identify the impact each problem can have on other IT objects, on the business services the objects support, and on customers and users of these services. 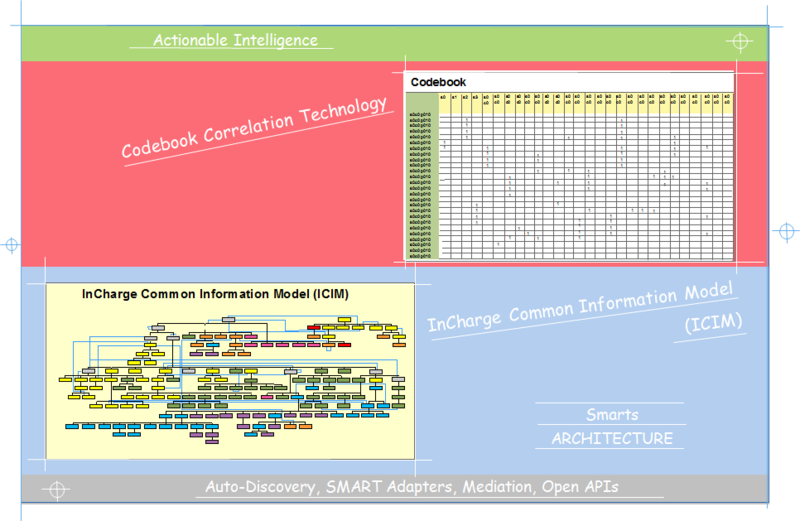 The “blueprint” for the A3 architecture contains the Codebook Correlation Engine and the InCharge Common Information Model technologies. With the built-in intelligence and automation provided by these key components, EMC Smarts can accurately diagnose any problem that might affect a dynamically changing network and its services. 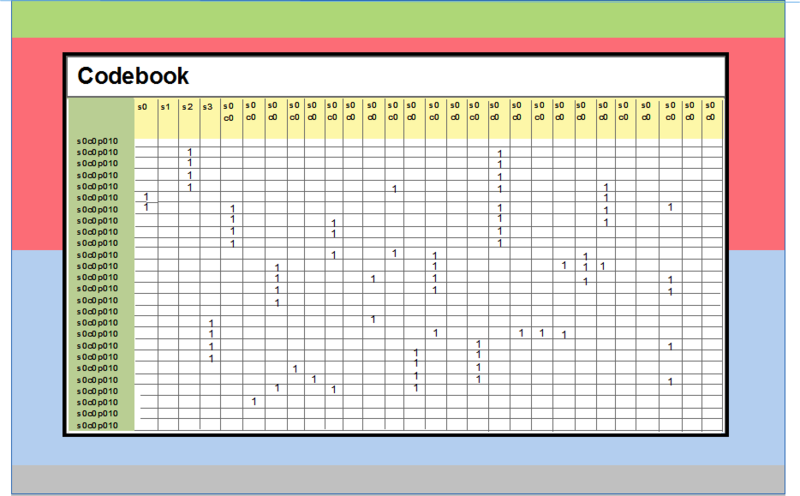 The codebook represents which symptoms or alarms occur when the problem arises in an environment. It uses the concept of “ signatures” to identify problems, where real-time events are matched with the problem signature. 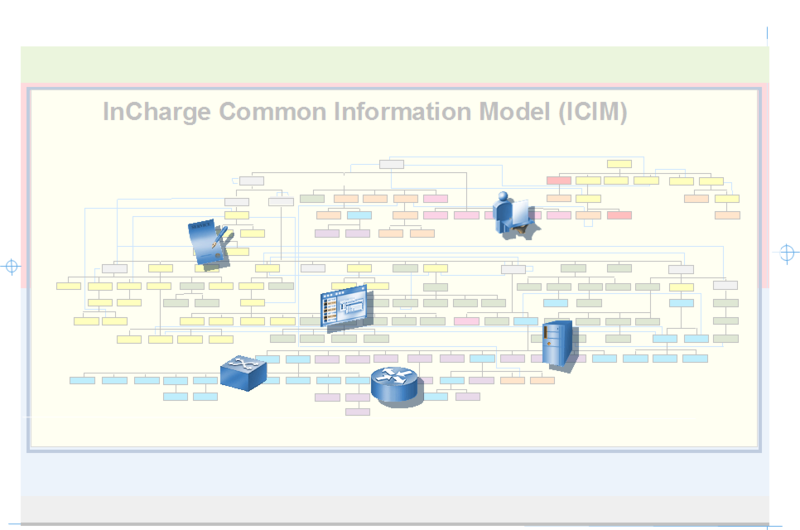 The InCharge Common Information Model is a conceptual and structural view of systems that applies object-oriented concepts to system management. It provides a unified representation and classification of logical and physical entities that describe their state, behavior, and relationships. 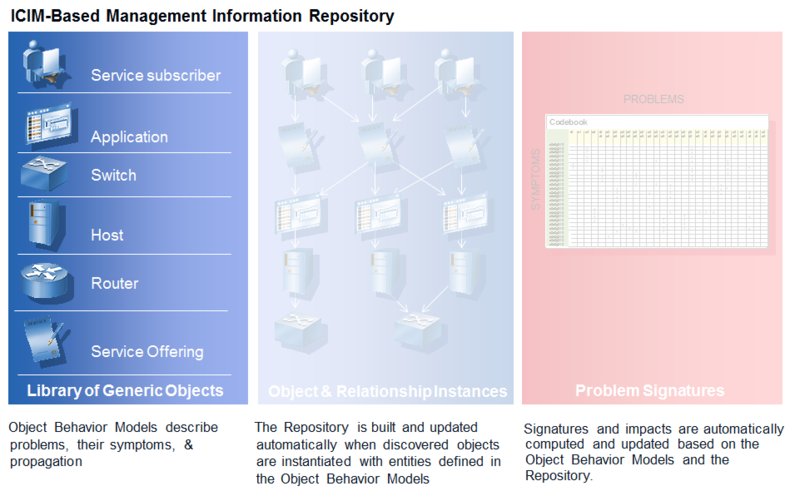 The model is an object oriented representation library of generic physical and logical objects, including the attributes of the object, the relationships it can participate in with other objects, its authentic problems, the characteristic symptoms each problem causes, and how they propagate along relationships to related objects. These generic objects represent the wealth of knowledge about that type of object and its behavior that is leveraged in Smarts solutions. The model uses generic objects, such as Switch, Host, Application, or Service Offering to represent IT items and their authentic problems. The model is basically a library of generic physical and logical objects that include attributes, relationships it can participate in with other objects, authentic problems, characteristic symptoms of problems it can cause, and how the problems propagate to related objects. These generic objects represent a wealth of knowledge about that type of object and its behavior. By associating business objects, such as services and customers, with applications at the edge of the network, Smarts can automatically correlate IT problems to business impacts. Object and relationship instances discovered in the environment are instantiated with the library of generic objects to automatically become part of a real-time inventory of, or repository for, the managed environment. Problem signatures, which are a set of symptoms that create a unique identifier for a problem, are derived from the library and repository. These signatures are stored in the Codebook. Previous Post Previous post: IT Roles changes in the new cloud era.. – oh yes, this minor aspect that we don’t pay attention to..